Washington, D.C. - -President and Mrs. Clinton this evening are hosting the 1997 National Medal of Arts Recipients and the National Medal of Humanities Recipients at a White House black tie dinner. Guests will begin arriving at the East Executive Entranc e at 7:00 p.m.. The guests will be seated at round tables in the State Dining Room. 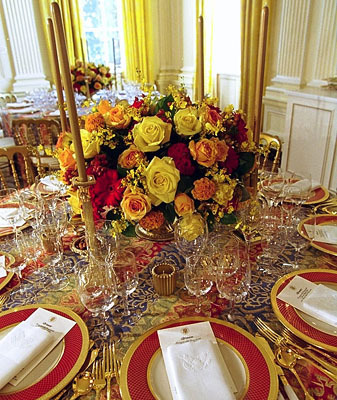 The tables will be set with Reagan china, Morgantown crystal, and vermeil flatware, on a damask red, gold, and blue striped tablecloth. The floral center pieces feature ambiance, sari, and golden yellow roses, red and yellow celosia and fall berries in assorted vermeil containers. The center pieces will be surrounded by four 11 inch classic gold candle sticks and gold tapers. Following dinner, the guests will be entertained in the East Room by violinist Nadja Salerno-Sonnenberg. Ms. Salerno-Sonnenberg, one of the world's foremost violinists, began her career at in Rome, where she began her violin training at the age of five. At the age of eight, she emigrated with her family to the United States to study at The Curtis Institute in Philadelphia. She later moved to New York to study at the Julliard School. Ms. Salerno-Sonnenberg is the recipient of the prestigious Avery Fisher Career Grant and winner of the Walter W. Naumburg 1981 International Violin Competition. Joining Ms. Salerno-Sonnenberg is Andrew Litton, pianist and director of the Dallas Symphony Orchestra. Litton won the 1997 Grammy for best choral recording of Walter's Belshazzar's Feast. Prior to joining the Dallas Symphony Orchestra, Litton spent six years as principal conductor and artistic advisor of Britain's Bournemouth Symphony Orchestra. William Friday, higher education administrator and humanities educator; Chapel Hill, North Carolina.